Select Photos on the menu at the left for tractor pull and parade! There are no world problems after a camp meeting. Overview of The Oaks from above Mineral Creek. Mineral Creek across the road from The Oaks. Yes, we have been a working ranch for generations and still are. Gathering Branding the small ones. Branding the big ones. The Oaks RV Park. Sandhill Cranes share the backyard. Mule Deer pop up anywhere. Let's play hide & seek. Javelina (collared Peccary) taking a sunset stroll. 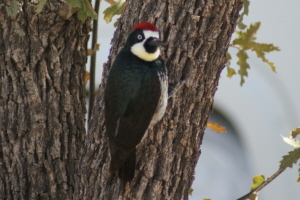 Acorn Woodpeckers hide acorns in the Oak Trees.